Coping with a new or worsening medical condition or illness can be stressful and sometimes overwhelming for you and your loved ones. We can assist you in your recovery with practical solutions that will ease the burden of healing. Our team of specialists provide support and can help educate you on how to recover from and manage illness in order to live independently again. Medical Home Health services are ordered by a physician, and are usually required on a short term basis. Medical home health services that we offer include skilled nursing, physical, occupational and speech therapy, and home health aide services. These services are paid for by Medicare, Medicare Advantage, private insurance, Veterans’ benefits, private pay and in some cases, Medicaid. Our team of social workers and senior care specialists are on hand to assist you with all of your questions or concerns regarding in-home treatment, managing your personal care or the care of your loved one, as well as any issues related to financing home care. Please call us for assistance. We will arrange an on-site consultation in your home, hospital room, or rehab center prior to the start of your home care services to alleviate any concerns you might have. 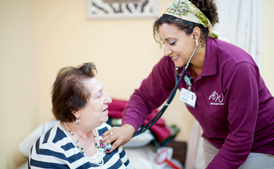 Know that your nurse is an expert at caring for you in the comfort and privacy of your home. Physical therapy treatment focuses on restoring function and preventing disability following a period of injury or the loss of a body part. Your physical therapist will work with you to help you gain greater mobility, muscle strength and performance, joint motion and balance. He or she can provide training on mobility devices if needed, including crutches, canes, walkers, wheelchairs and artificial limbs or braces. Occupational therapists provide you and your family with the tools necessary to optimize your home environment relative to your individual abilities so you can participate fully in daily life activities. We have often found that simple activity or home modifications are a key factor in enabling individuals to “age in place,” or live in the home of their choice. Home modifications, or simple adaptations to living environments, can benefit clients of all ages with certain health conditions, sensory or movement impairments, or cognitive disorders by supporting the safe performance of necessary and desired daily activities (occupations), and well-being. The occupational therapist may offer recommendations for alterations, adjustments, or additions to the home environment through the use of specialized, customized, off-the-shelf, or universally designed equipment, products, and hardware controls that can be the difference between safely living at home and having to consider moving to a higher level of care facility. Often simple cues for arranging furniture or other features that affect the layout of an environment can be just the trick needed to increase safety and function. Occupational therapists are specially trained in these procedures and ready to evaluate your environment. Please give us a call for more information. Medicare will cover a limited amount of home health care services as an alternative to entering a nursing home when it is needed in combination with skilled nursing or therapy home care for the recovery or rehabilitation of a short-term illness. Our home health aides are supervised by the visiting nurse or therapist while skilled services are being provided in the home. It is our belief, which is supported by research, that encouraging independence yields much better outcomes for people recovering from illness or injury. One difference we pride ourselves on is that our home health aides are given additional training and work closely with the therapy team to see that clients are receiving instruction and encouragement in performing their own care to the maximum of their ability. While it is very helpful and often necessary for safety to have that extra person there to assist with bathing and personal care, our home health aides don’t just “give baths”, but are trained to follow a care-plan that is specific to each client. We invest in the health, safety and happiness of our clients, which is why we employ medical social workers full time at AW Healthcare. We believe that the skills of someone who is trained in the art of locating resources and plugging clients into available and needed assistance programs is an invaluable asset to our clients and to our whole team. Assist with long range planning including advance directives, and overall care options.